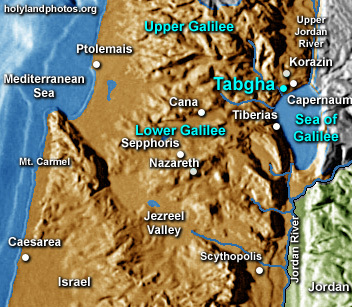 Tabgha (Arabic form of the Greek “Heptapegon” = “the place of the seven springs”) is located 2.1 mi. [3.5 km.] southwest of Capernaum. Although not mentioned in the Gospels, it marks the traditional site associated with Jesus multiplying the loaves and fishes to feed 5,000 (Mark 6:30–44). At least four Christian structures have stood on this site: a fourth century chapel, a Byzantine Church (ca. A.D. 480), and two twentieth century churches—the most recent being dedicated in A.D. 1982. This latter church was built on the plan of the fifth century Byzantine basilica.